Answer: People ask me that question all the time. Unfortunately, it’s not an easy one to answer. The problem is the acronym “UFO” has different meanings depending on who you talk to. Before I answer the question, let’s clarify some definitions. 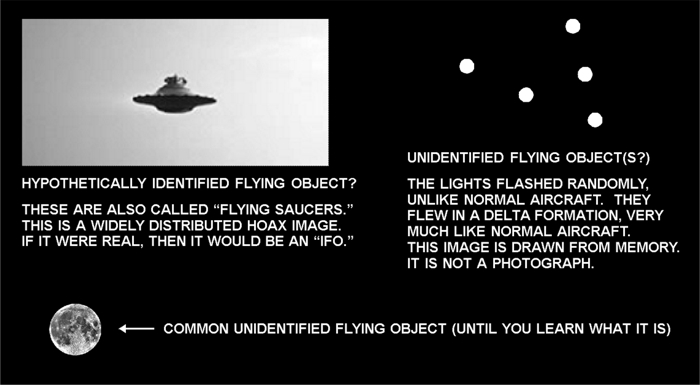 UFO stands for “unidentified flying object.” So to qualify as a UFO, whatever you see in the sky must be unusual. You’ve never seen it before, and you have no idea what it is, at least for the moment. Over the 40-some years I’ve studied the sky, this has happened dozens of times. And in (almost) every case I was able to later identify exactly what I saw. It required some research and analysis, but I was curious and really wanted to know what it was that I saw. Some of my UFO sightings that became IFO’s were: Venus at extremely high brightness, the exhaust trail from a rocket launch, a low altitude satellite, a helicopter, and a large bird. But back in 1997, on the evening of March 13th, I saw something I still haven’t positively identified. It was seen by many observers and saturated local media, who dubbed it the “Phoenix Lights.” To this day, my best guess is that it was a group of military aircraft — but I really don’t know for sure.